We will now see a few examples to get started with using Qt Style Sheets. This means that every widget whose mandatoryField Qt property is set to true would have a yellow background. This time, we will show how to create a red QPushButton. This QPushButton would presumably be connected to a very destructive piece of code. We have made a request that cannot be satisfied using the native styles alone (e.g., the Windows XP theme engine doesn't let us specify the background color of a button). Therefore, the button is rendered using style sheets. We haven't specified any values for border-width and border-style, so by default we obtain a 0-pixel wide border of style none. The only issue remaining is that the button doesn't react when we press it. We can fix this by specifying a slightly different background color and use a different border style. This positions the myindicator.png to the center right of the QPushButton's padding rectangle (see subcontrol-origin for more information). This section provides examples to customize specific widgets using Style Sheets. Styling of a QCheckBox is almost identical to styling a QRadioButton. The main difference is that a tristate QCheckBox has an indeterminate state. We will look at an example where the drop down button of a QComboBox appears "merged" with the combo box frame. Note: To customize the separator (resize handle) of a QDockWidget, use QMainWindow::separator. A QFrame is styled using the The Box Model. Let us look at an example that moves the QGroupBox's title to the center. The QProgressBar's border, chunk, and text-align can be customized using style sheets. However, if one property or sub-control is customized, all the other properties or sub-controls must be customized as well. For example, we change the border to grey and the chunk to cerulean. This leaves the text-align, which we customize by positioning the text in the center of the progress bar. A margin can be included to obtain more visible chunks. In the screenshot above, we use a margin of 0.5 pixels. For a QPushButton with a menu, use the ::menu-indicator subcontrol. Checkable QPushButton have the :checked pseudo state set. The QScrollBar can be styled using its subcontrols like handle, add-line, sub-line, and so on. Note that if one property or sub-control is customized, all the other properties or sub-controls must be customized as well. The scroll bar above has been styled in aquamarine with a solid grey border. The left-arrow and right-arrow have a solid grey border with a white background. As an alternative, you could also embed the image of an arrow. QSizeGrip is usually styled by just setting an image. A QSplitter derives from a QFrame and hence can be styled like a QFrame. The grip or the handle is customized using the ::handle subcontrol. Suppose we'd like our selected item in QTableView to have bubblegum pink fade to white as its background. The tabs of the QToolBox are customized using the 'tab' subcontrol. There are three types of QToolButtons. The QToolButton has no menu. In this case, the QToolButton is styled exactly like QPushButton. See Customizing QPushButton for an example. The QToolButton has a menu and has the QToolButton::popupMode set to QToolButton::DelayedPopup or QToolButton::InstantPopup. In this case, the QToolButton is styled exactly like a QPushButton with a menu. See Customizing QPushButton for an example of the usage of the menu-indicator pseudo state. QToolTip is customized exactly like a QLabel. In addition, for platforms that support it, the opacity property may be set to adjust the opacity. 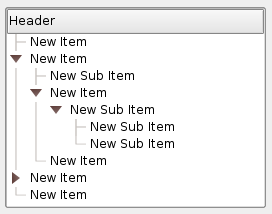 The branches of a QTreeView are styled using the ::branch subcontrol. The following stylesheet color codes the various states when drawing a branch. This section lists some common mistakes when using stylesheets. When styling a QPushButton, it is often desirable to use an image as the button graphic. It is common to try the background-image property, but this has a number of drawbacks: For instance, the background will often appear hidden behind the button decoration, because it is not considered a background. In addition, if the button is resized, the entire background will be stretched or tiled, which does not always look good. It is better to use the border-image property, as it will always display the image, regardless of the background (you can combine it with a background if it has alpha values in it), and it has special settings to deal with button resizing. See also Style Sheet Example, Supported HTML Subset, and QStyle.